Newspaper Rock: Did Indians inspire Jack Kirby? By Will NixonA young artist named Jack Kirby, born in 1917, grew up with an enduring fascination with world mythology and with comics. Kirby was especially interested in the Hopi, and imitated Hopi designs and patterns in his drawing style. Over time, he became known as "King of the Comics," and his enduring interest in ancient Hopi myths influenced millions. Kirby's most personal work of genius, the unfinished "Four Worlds" series, was based on the Hopi myth of Creation by the same name. One can also see his devotion to the Hopi in the creation of his Terrible Totem villain, a wooden character that is an amalgam of several Hopi kachinas and monsters. At that time, comic book story writers saw themselves as part of a tradition of heroic fiction, and so did not usually extract wholesale from existing myths but used elements creatively according to their particular genius. This was the way in which Jack Kirby brought the spirit of the Hopi hero myths to millions of young Americans in the 1950s and 1960s during a time in which people were struggling to find more earth-friendly values. Jack Kirby (with Stan Lee) invented Spider-Man, who embodies many of the qualities of Grandmother Spider, also known as Spider Woman. Kirby and Lee also invented X-Men, whose original characters included The Beast (the forerunner of Beast Boy, a shape-shifter based on Hopi mythology), Ice Man (somewhat like the North Wind of Ojibway stories), Marvel Girl (who is telepathic, and can "talk in someone's ear" without being seen, but in a different way than Spider Woman can), and the Cyclops (from Greek myth). Later X-Men included Mystique, who is a shape-shifter. Kirby then invented the Incredible Hulk, who is perhaps like Man-Eagle in many respects, only good. I've never seen any Hopi designs or patterns in his drawings. 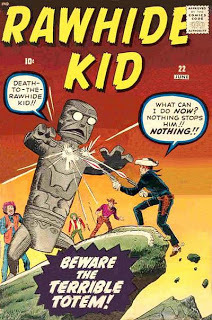 Kirby modeled the Terrible Totem on totem poles (duh) from the northwest, not kachinas from the southwest. When Kirby took over the Green Arrow series in the mid-1950s, he turned Green Arrow and his sidekick Speedy into Batman and Robin clones. He downplayed or ignored Speedy's Navajo origin--not what you'd expect if he was infusing everything with Native lore. Kirby was only briefly involved with Spider-Man. His version was a gadget-using guy like the Human Fly, with suction cups and a web gun. It was the opposite of a nature- or mythology-based spider hero. Stan Lee was involved in the creation of all the heroes mentioned, so it's doubtful how much rein Kirby had to use his alleged interest in the Hopi. Nixon claims the heroes derived from Navajo, Zuni, and Ojibway legends. None of these are Hopi. How could their legends influence Kirby if he was interested in the Hopi? Learning about one tribe doesn't make you an expert on several hundred other tribes. The Fantastic Four's power almost certainly came from the Greek belief in the four elements: air, water, fire, and earth. I'll concede that the Hopis' "fourth world" concept may have inspired Kirby. The basic idea of worlds dying and being reborn could be Native, even if the details aren't. The other claims seem farfetched. But Kirby probably had some familiarity with Native lore. As much as the average American, at least. He drew all kinds of comics, especially Westerns, where Indians were bound to appear. Kirby created or co-created Wyatt Wingfoot and his Keewazi tribe in Fantastic Four #50. Wingfoot was one of the first modern-day Indians in comics. He pitted the Fantastic Four and Wingfoot against Tomazooma in Fantastic Four #80. Tomazooma was a giant robot based on Keewazi legend. It vaguely resembled a Hopi kachina. 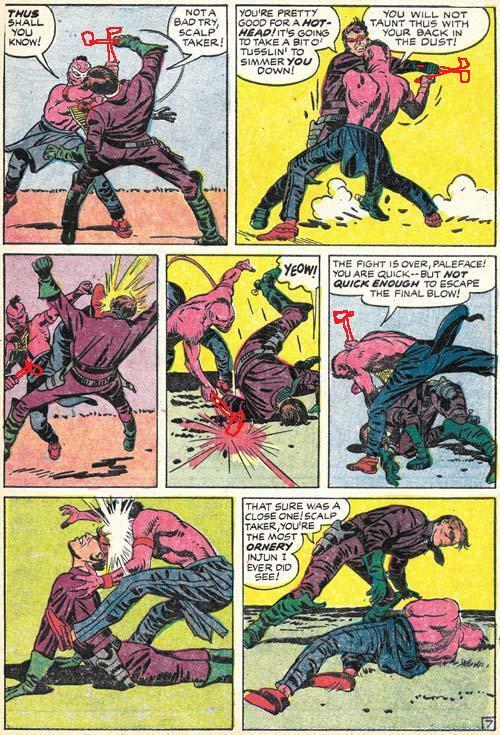 In Captain America's Bicentennial Battles, Kirby had Captain America meet Geronimo. 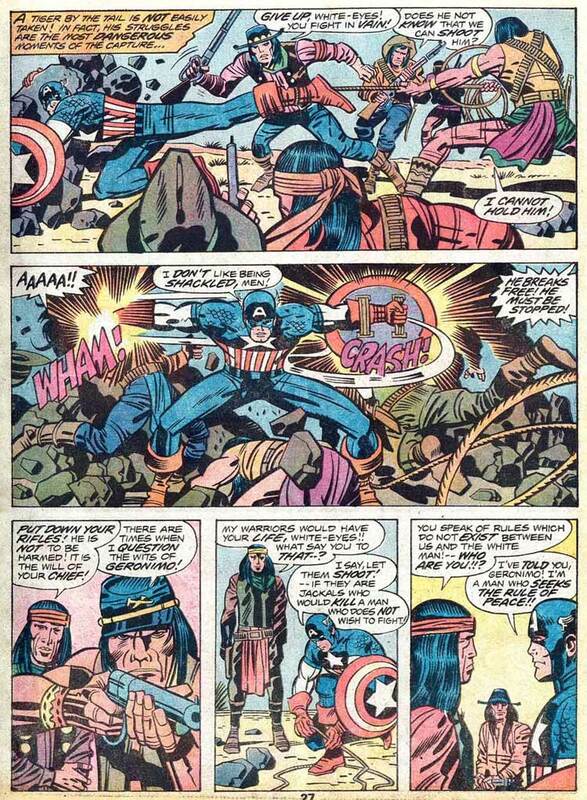 Cap tries to stop a battle between the Apaches and the US Army. Kirby's Eternals series was based on the "ancient astronauts" premise--the idea that aliens came to earth long ago and aided nascent civilizations, especially those in the Americas. The series begins with an archaeologist discovering alien artifacts in an Inca tomb. Whether these few examples signify a special interest in Indians is hard to say. These are a few comics out of the thousands Kirby produced. Probability suggests Indians should've appeared about 1% of the time, so that's all this may be. I read the full article. I did think he was reaching a bit when trying to link assorted Marvel superheroes to Native American mythical heroes. Western myths and legends have their share of superhumans, gods, and paranormals.